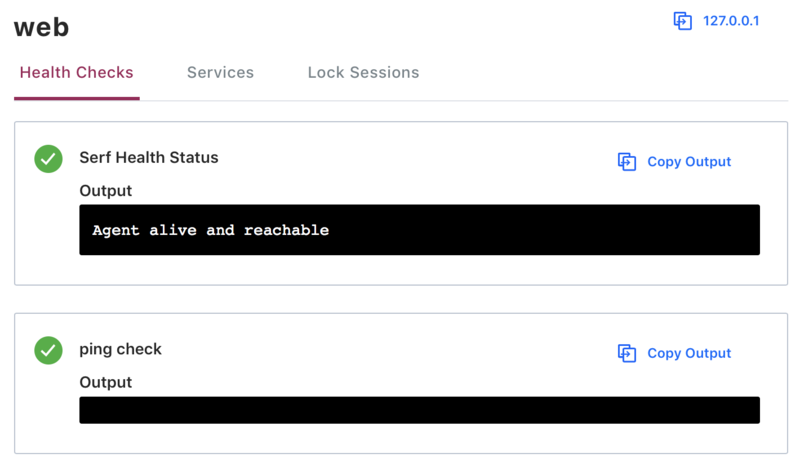 HashiCorp Consul is a service mesh for service discovery, runtime configuration, and service segmentation for microservice applications and infrastructure. Consul enables the registration and discovery of services "internal" to your infrastructure as well as "external" ones such as those provided by third-party SaaS and other environments in which it is not possible to run the Consul agent directly. 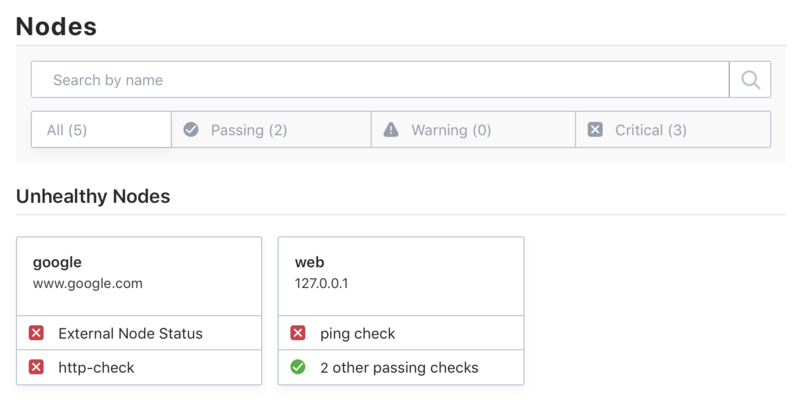 All of the examples in this post use the Consul agent (download) version 1.2.1 running locally in -dev mode with the Consul -ui enabled and use the -enable-script-checks flag to allow a simple ping-based health check. We also provide a node name of web rather than the default of hostname to make the examples clearer. With the Consul dev agent running, the examples in this post use curl to interact with Consul's HTTP API as well as Consul’s Web UI, available at http://127.0.0.1:8500. Agent: Long-running daemon on every member of the Consul cluster. The agent is able to run in either client or server mode. Node: A node represents the "physical" machine on which an agent is running. This could be a bare metal device, VM, or container. Service: A service is an application or process that is registered in Consul's catalog for discovery. Services can be internal (inside your datacenter) or external (like an RDS cluster) and may optionally have health checks associated with them. Check: A check is a locally run command or operation that returns the status of the object to which it is attached. Checks may be attached to nodes and services. Catalog: The catalog is the registry of all registered nodes, services, and checks. First, we'll take a look at how to register internal services. In the context of Consul, internal services are those provided by nodes (machines) where the Consul agent can be run directly. Internal services are registered via service definitions. Service definitions can be supplied by configuration files loaded when the Consul agent is started, or via the local HTTP API endpoint at /agent/service/register. This example web service will have unique id web1, logical name web, run on port 80 and have one health check. Registering a service definition with the agent/service/register endpoint registers the local node as the service provider. The local Consul agent on the node is responsible for running any health checks registered for the service and updating the catalog accordingly. This health check verifies that our web service can connect to the public internet by pinging google.com every 30 seconds. In the case of an actual web service, a more useful health check should be configured. Consul provides several kinds of health checks, including: Script, HTTP, TCP, Time to Live (TTL), Docker, and gPRC. The health of individual services can be queried with /health/service/:service and nodes can be queried with /health/node/:node. In the context of Consul, external services are those provided by nodes where the Consul agent cannot be run. These nodes might be inside your infrastructure (e.g. a mainframe, virtual appliance, or unsupported platforms) or outside of it (e.g. a SaaS platform). Because external services, by definition, run on nodes where there is not Consul agent running, they cannot be registered with that local agent. Instead, they must be registered directly with the catalog using the /catalog/register endpoint. The object context for this endpoint is the node, rather than service like with the /agent/service/register endpoint. When using the /catalog/register endpoint, an entire node is registered. With the /agent/service/register endpoint, which is the endpoint we used in our first example above, individual services in the context of the local node are registered. Node and Address are both required since they cannot be automatically determined from the local node Consul agent. Services and health checks are defined separately. 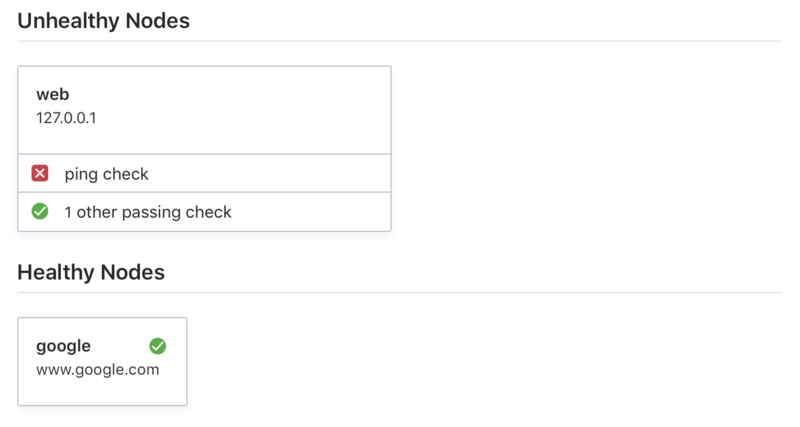 If a ServiceID is provided that matches the ID of a service on that node, the check is treated as a service level health check, instead of a node level health check. The Definition field can be provided with details for a TCP or HTTP health check. For more information, see Health Checks. This configuration defines a node named google available at address www.google.com that provides a search service with an ID of search1 running on port 80. It also defines an HTTP-type health check to be run every 30 seconds and sets an initial state for that check of passing. Typically external services are registered via nodes dedicated for that purpose so we’ll continue our example using the Consul dev agent (localhost) as if it were running on a different node (e.g. "External Services") from the one running our internal web service (e.g. "Web). In our example of an internal web service, we verified our health check was active by querying the local agent endpoint /agent/checks. If we query this again after adding our external service, we won't see the health check listed because it was registered with the service catalog not the local agent. Instead, we need to query a catalog-level endpoint such as /health/service/:service, /health/node/:node, /health/state/:state. We can see from the above that there is an entry for this health check in the catalog. However, because this node and service were registered directly with the Catalog, the actual health check has not been setup and the node's health will not be monitored. To demonstrate the difference between health checks registered directly with the catalog versus through a local agent, query for node health before and after simulating an outage. In the output above we no longer see a passing check for the internal web service but we continue to see the passing check for the external search service when we should not. Health checks for both services should fail while disconnected from the internet but only the check for our internal web service is showing as failing. One of the problems with traditional health checking is the use of a pull model. On a regular interval, the monitoring server asks all the nodes if they are healthy and the nodes respond with a status. This creates a bottleneck because as the number of nodes scales, so does the amount of traffic to the monitoring service. This clogs local network traffic and puts unnecessary load on the cluster. Consul uses a push-based model where agents send events only upon status changes. As such, even large clusters will have very few requests. The problem with edge triggered monitoring is that there are no liveness heartbeats. That is, in the absence of any updates, Consul does not know if the checks are in a stable state or if the server has died. Consul gets around this by using a gossip-based failure detector. All cluster members take part in a background gossip, which has a constant load regardless of cluster size. The combination of the gossip and edge triggered updates allows Consul to scale to very large cluster sizes without being heavily loaded. Because Consul monitoring requires that a Consul agent be running on the monitored service, health checks are not performed on external services. To enable health monitoring for external services, use Consul External Service Monitor (ESM). 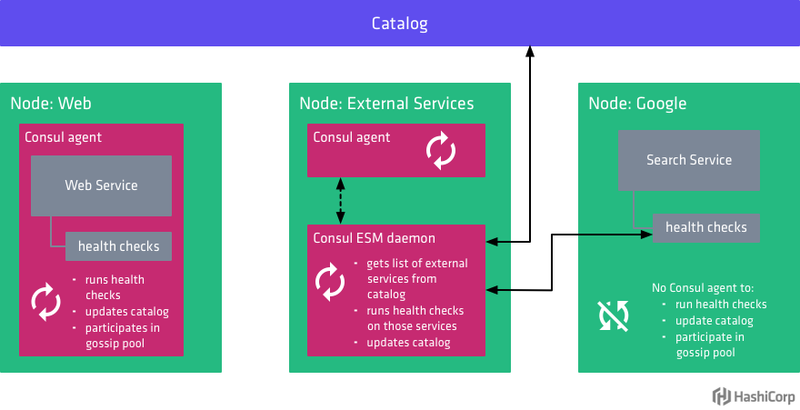 Consul ESM is a daemon that runs alongside Consul in order to run health checks for external nodes and update the status of those health checks in the catalog. Multiple instances of ESM can be run for availability, and ESM will perform a leader election by holding a lock in Consul. The leader will then continually watch Consul for updates to the catalog and perform health checks defined on any external nodes it discovers. This allows externally registered services and checks to access the same features as if they were registered locally on Consul agents. Consul ESM is provided as a single binary. To install, download the release appropriate for your system and make it available in your PATH. The examples in this post use Consul ESM v0.2.0. Open a new terminal and start Consul ESM with consul-esm. "external-node" identifies the node as an external one that Consul ESM should monitor. "external-probe": "true" tells Consul ESM to perform regular pings to the node and maintain an externalNodeHealth check for the node (similar to the serfHealth check used by Consul agents). Consul ESM supports HTTP and TCP health checks. Ping health checks are added automatically with "external-probe": "true". Consul internal services are those provided by nodes where the Consul agent can be run directly. External services are those provided by nodes where the Consul agent cannot be run. Internal services are registered with service definitions via the local Consul agent. The local Consul agent on the node is responsible for running any health checks registered for the service and updating the catalog accordingly. 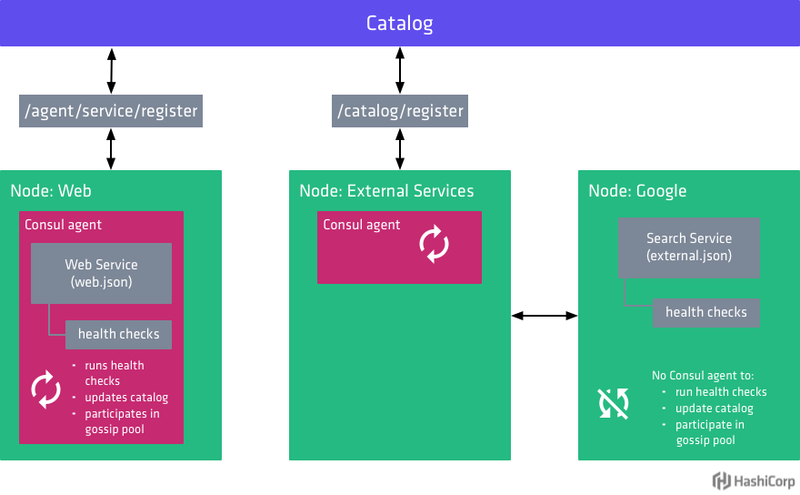 External services must be registered directly with the catalog because, by definition, they run on nodes without a Consul agent. Both internal and external services can have health checks associated with them. Health checking in Consul uses a push-based model where agents send events only upon status changes. Consul provides several kinds of health checks, including: Script, HTTP, TCP, Time to Live (TTL), Docker, and gPRC. Because Consul monitoring requires that a Consul agent be running on the monitored service, health checks are not performed on external services. To enable health monitoring for external services, use Consul External Service Monitor (ESM).